Future of Funds: How Technology and Social Media are Disrupting and Opening new Opportunities for the Fund Industry. Perhaps the biggest change that online trading technology has brought about is to democratise access to the markets, allowing individuals to make their own trades without the costs and time lag that were associated with the old way of doing this. The alternative investment industry is going through a pick in growth. Self-directed investors and organisations such as funds, hedge funds are reshaping the Financial industry and as this happens they are looking for unconventional alternative investment solutions. The newest generation of investors is made of do it yourself workers, the first to grow up entirely in the age of digital tools, smart phones and the internet. These new investors don’t view investments as simple stocks and bonds run by conventional Wall Street, the City of London or Switzerland. They are increasingly learning with innovative disruptive new tools and looking at the investment process as a do-it-yourself project using technology and social networking to invest in ideas, not asset classes. The alternative investment industry is now in continuous revolution, special with the Fintech revolution going on and recently the Panama Papers will challenge the industry in ways still news to look. The industry has evolved over three decades to become an important part of the financial system and a powerful innovative player in the global economy. The alternative investment industry growth can be traced to a range of external factors, with special the focus on regulatory changes, modifications and all the economic (and political) cycles, and special the technological developments, all are playing critical roles. Within this macro context, entrepreneurs and finance innovation organisations founded a range of firms utilizing a diverse mix of value sources to generate returns for investors. 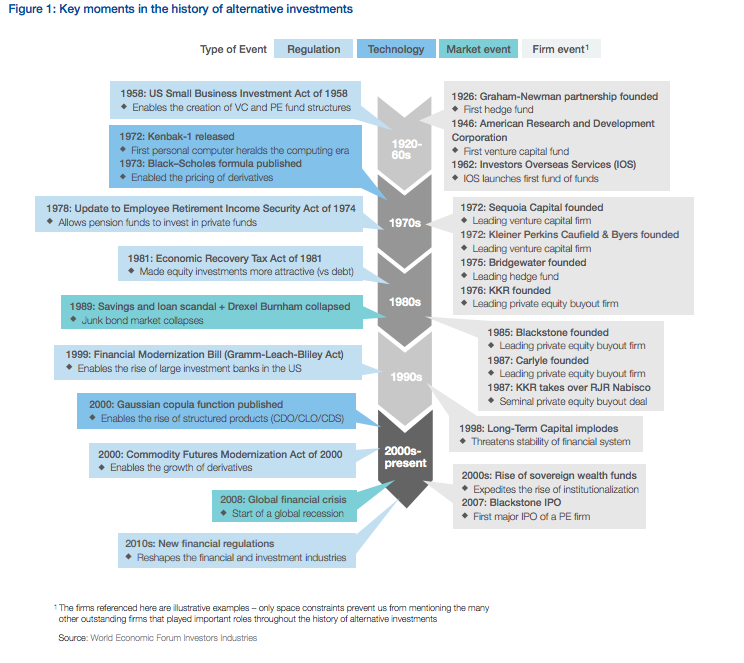 The bellow graphic from the World Economic Forum summarizes influential factors and events in the history of alternatives. 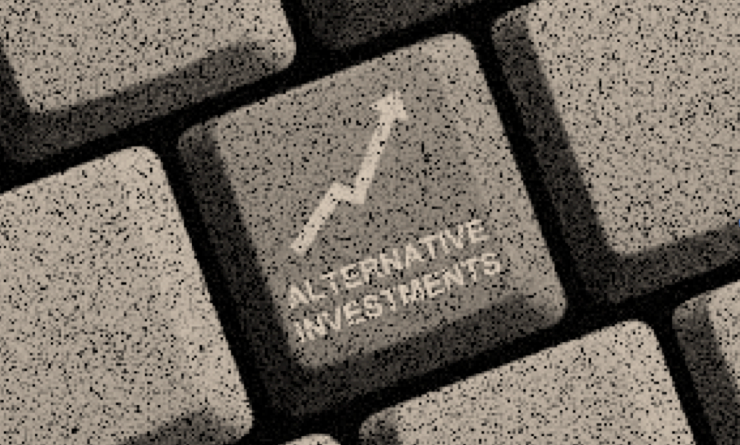 The Future of the Alternative Investment Industry – A changing financial landscape! The financial services industry still recovering from one of its biggest crashes and now immersed in a credibility crisis, regulatory tape will need to change how it approaches clients and special investors. 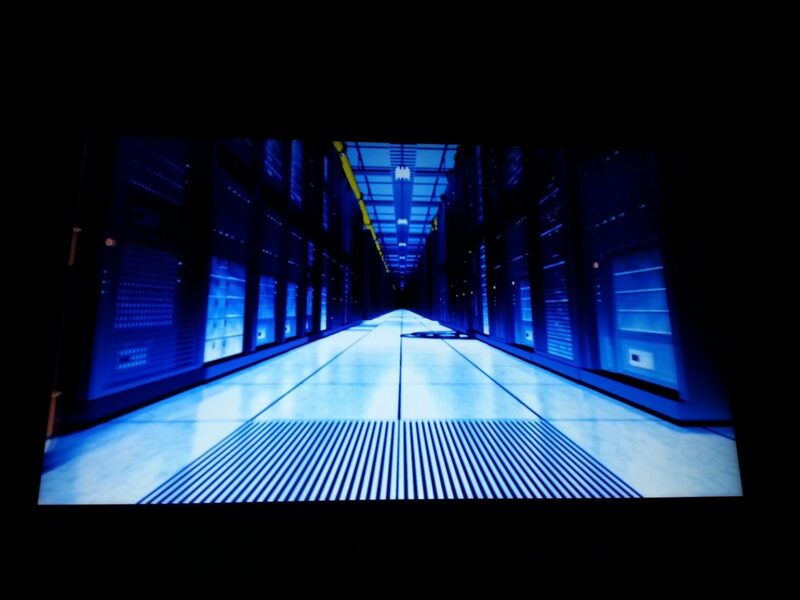 Also its product and services need to be focus on creating value in order to remain relevant. Investors are more sophisticated than ever and as they have never been entirely comfortable trusting the conventional Financial industry ripe with conflicts of interest, high fees, and way too many salespeople are looking at other alternatives. The emergence of the digital economy as empowered a new generation of investors with advanced information, financial education, tools, big data and advanced trading platforms at their fingertips. These investors have begun to select investments based on their personal interests and going the extra mile to learn and understand what ideas and sentiments are more relevenat for their business, rather than cash flow and income statements. In short, the alternative investment industry is also being challenged by the fact that software (and now Fintech) is eating the economic and financial world. (…) “we are in the middle of a dramatic and broad technological and economic shift in which software companies are poised to take over large swathes of the economy.” using the words of Marc Andreessen, in his famous article in WSJ. New finance and the emergence of Fintech new technologies and accessible platforms together with the growth and credibility of peer to peer funding and Crowdfunding developed an alternative new way of looking at the investment. An investment that is macro and idea-based investing. In the video conference bellow Future of Funds at London Capital Club organised by JP Funds Group and Saxo Capital Markets 2015 I highlighted some of the ideas and trends that are challenging the Future of the Funds industry and some solutions as well. It is a personal provocative approach where I tried to highlight different ways technology, social media are disrupting the financial industry.